Known as the loyal domestique, Diego Rosa (Astana) got a rare chance to ride for himself in today’s Milan-Turin and grabbed the opportunity with both hands as he rode to a solo win in the star-studded race. The Italian launched an unstoppable solo attack on the climb of Colle Superga and held off the lone chase of Rafal Majka (Tinkoff-Saxo) to take his first pro win. Fabio Aru made it two Astana riders on the podium. When he turned pro win the Androni team in 2013, it was already evident that Diego Rosa is one of the biggest climbing talents in the peloton. However, an injury-filled 2014 season saw him slip be slightly under the radar and so it didn’t get much attention when Astana picked him up for 2015. However, this year has really been a breakthrough for Rosa. He may not have achieved many personal results but he has fully proved his potential, playing key roles for Fabio Aru in both the Giro and the Vuelta. Already in the beginning of the season he was flying, prompting Richie Porte to claim that he even looked stronger than Aru. Rosa has always played the role of loyal domestique but today he got a rare chance to ride for himself. As he hails from the Turin area, Milan-Turin is his home race and even though Astana lined up both Mikel Landa and Fabio Aru, he was given the chance to ride for himself. He grabbed that opportunity with both hands as he turned out to be clearly the strongest rider, taking a hugely impressive solo win. He attacked on the final climb of Colle Superga at a point when all the stars were at their limit and from there the outcome was never in doubt. At the bottom of the final 4.9km climb that averaged 9.1%, the peloton had been whittled down to Pozzovivo, Bardet, Dupont, Latour, Montaguti, Vuillermoz (Ag2r), Pellizotti (Androni), Aru, Landa, Rosa, Tiralongo (Astana), Bongiorno, Zardini (Bardiani), Buchmann, Konrad (Bora), Pinot, Jeannesson, Elissonde (FDJ), Visconti, Moreno, Rojas (Movistar), Cunego (Nippo), Martin, Villella (Cannondale), Machado, Moreno, Trofimov, Losada (Katusha), Kruijswijk, Bennett (LottoNL), Poels, Henao (Sky), Majka, Sørensen, Poljanski (Tinkoff-Saxo), Zubeldia and Arredondo (Trek) and it was Tiralongo who did the hard work in the flat section leading to the ascent. As soon as they started to climb, Montaguti launched an attack and he got a small gap while Rojas started to chase for Movistar. Majka launched a surprisingly early attack and sprinted past Montaguti. That’s when Rosa first showed his cards as he quickly brought the Pole back. Villella launched an immediate counterattack and got a nice gap before Sørensen started to ride tempo for Tinkoff-Saxo. Vuillermoz was the next to make a move but Rosa easily brought him back. Vuillermoz went again and this time only Rosa and Moreno could follow. The trio quickly caught Villella to form a strong front quartet and this forced Sørensen back into chase mode. Majka was unstoppable and managed to bridge the gap but soon after Henao led the rest of the small main group back to the front. Realizing that the peloton was back, Vuillermoz went again and only Rosa, Majka, Villella, Moreno, Pozzovivo, Poels, Pinot, Henao, Bardet, Aru and Cunego could follow. That’s when Rosa made his move and no one was able to respond to his big attack. When he had a big gap, Majka went again but Poels, Bardet, Moreno, Pozzovivo, Vuillermoz, Aru and Pinot responded. Instead, it was Poels launching a strong solo move and it briefly looked like he was going to make it across. Further back, a group with Vuillermoz, Aru, Majka, Henao, Villella, Cunego, Bardet, Pinot, Pozzovivo and Visconti gathered. Majka was unstoppable and made the next move which only Pinot could match. He rode the Frenchman off his wheel and passed the fading Poels who fell back to Pinot, Pozzovivo and Moreno. At the passage of the flamme rouge, Rosa was 14 seconds ahead of Majka and 18 seconds ahead of the chase group that had been joined by Aru. Here Pinot made one final desperate surge and he started to approach Majka. With 500m to go, Rosa had a 16-second advantage and it was clear that he was riding away with the win. He had plenty of time to celebrate the victory while Majka held off a late comeback by Aru to take second, with the Italian passing Pinot in the battle for third. Poels completed the top 5. The series of Italian one-day races continues tomorrow with GranPiemonte which should see the sprinters come back to the fore before the big finale on Sunday at Il Lombardia. The 2015 Milan-Turin was held on a 186km course hat brought the riders from San Gioliano Milanese on the outskirts of Milan to the traditional summit finish on the Colle Superga on the outskirts of Turin. The first 162km were almost completely flat and led to the bottom of the main challenge which would be covered twice. The climb was 4.9km long and averaged 9.1% , with the first passage coming 19.5km from the finish. From there, the riders descended to a short flat section before they tackled the climb for the final time. It was a sunny day in Italy when the riders gathered for the start but one rider was absent. For the second day in a row, Gregor Mühlberger (Bora-Argon 18) failed to sign in. Like in yesterday’s Tre Valli Varesine, it was a fast start with numerous attacks that made it hard for anyone to get clear. However, unlike yesterday, it was a pretty small group that emerged after just 8km of racing when Luca Chirico (Bardiani), Samuele Conti (Southeast), Alessandra Malaguti (Nippo) and Nicolas Lefrancois (Novo Nordisk) attacked. They were joined by Daniel Teklehaimanot (MTN-Qhubeka) and as the peloton slowed down, they already had an advantage of 1.50 at the 15km mark. The peloton was content with the situation so the gap quickly went out to 5.20 before Astana took control. At the 35km mark, they had slightly reduced the gap to 5.04. The situation remained stable but the peloton still sped along at a rapid pace as they covered 45.4km during the first hour. At the 50km mark, Astana had reduced the gap to 4.50. 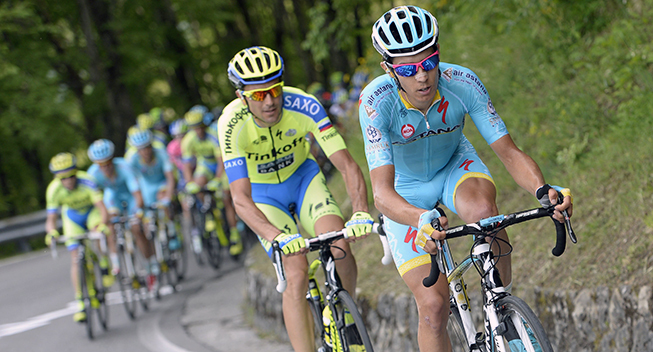 Astana continued their steady chase and at the 75km mark they had brought it down to 3.40. Not wanting to catch the escapees too early, the Kazakh team slowed slightly down and allowed it to go back out to more than 4 minutes. At the 100km mark, it was 4.12. Dario Cataldo and Valerio Agnoli had been given the job of keeping the situation under control and they allowed the gap to go out to 4.40 with 55km to go. They kept it around that mark until Movistar came to the fore with 48km to go. Jose Herrada, Eros Capecchi and Francisco Ventoso started to trade pulls with Cataldo and Agnoli and that had a big effect on the gap. With 44km to go, it was 4.05 and as they entered the final 40km, it was just 3.10. With 35km to go, the gap was 2.35 and now the fight for position really intensified. Astana and Movistar were nearly swamped by the many teams who want to be on the front until Alessandro Vanotti regained control for Astana. Ventoso also took one final turn before Southeast took over with Simone Ponzi. Bardiani, Southeast, Movistar and Katusha sprinted on the front but were passed by Tinkoff-Saxo who took control with 27km to go. That was enough to being the break back even though Conti and Malaguti tried to prolong their time in the front. Katusha took over with Sergey Lagutin but was passed by Ian Boswell and the rest of the Sky train. Vasil Kiryienka took over and led the peloton onto the climb where he set a brutal pace on the lower slopes. Valerio Conti (Lampre-Merida) crashed in the final turn before the climb. The Belarusian swung off when his teammate Leopold König launched the first attack. He was joined by Marc Soler (Movistar) but Tiralonfo went straight to the front and slowly reeled them in. From there, the veteran stayed in control, gradually whittling the group down and sending riders like Wilco Kelderman and Tom-Jelte Slagter out the back door. Tiralongo led the small group over the top of the climb and safely negotiated the descent. He also set the pace all the way to the final climb where the final drama played out.